At last weeks second public meeting on the Santa Susana Mountains Trails Master Plan, the County presented a comprehensive map showing their planned trails, the existing trails, and the relevant delineations of private, public and utility lands. While public comments were made, they weren’t being recorded. CORBA would like to express our sincere thanks and gratitude to L.A. County Parks and Recreation Planning Division staff for moving this trail plan forward, and to Supervisor Antonovich for his support of the process. CORBA whole-heartedly supports project, the process, and the deliverables (maps) presented at the meeting last week. In looking at the final draft map, we were pleased to see that the agency had listened to the prior comments asking to expand the study area so that true connectivity between disparate open spaces and existing trails could be explored more thoroughly and with a more regional view. From our cursory review of the maps presented at the meeting, we can say that the work that has gone into this planning effort has been very much worthwhile. We feel the document is a great step towards achieving the stated goals of identifying missing links, providing connectivity between existing trails, open spaces and jurisdictions, and recognizing the value of some of the existing non-system trails. We feel the eventual implementation of the plan will increase both the quality, quantity, and variety of recreational experiences the community so badly needs. We are also sensitive to the concerns of private property owners who expressed feelings that they hadn’t been heard. However, we also feel that many of their concerns arose from an incomplete understanding of the goals of this planning process. In some cases, it seemed their negative experiences with other neighboring public land managers have elevated their concerns about dealing with the County. We hope that as the plan is implemented and negotiations take place with private land owners (and the neighboring public land managers), their fears can be allayed and mutually beneficial compromises reached for the benefit of the entire trail user community and the public-at-large. The County’s policy favoring shared-use trails including bicycles is very important to us as a trail advocacy group comprised of bicyclists. We know that there are several places where proposed County trails will connect to trails in City of Los Angeles parks such as O’Melveny and Limekiln Canyon. On these City trails bicycles are presently prohibited. It is our hope that the County and City can come to a compromise that would allow bicycles to connect legally to the proposed County trails/trailheads that are only accessible through City property and trails. 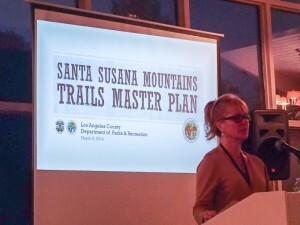 Since this Trail Master Plan will be incorporated into the County General Plan, we feel it would also be worth coordinating proposed trailheads with the 2012 L.A. County Bicycle Master Plan. Having trailheads accessible by bicycle-friendly infrastructure such as Class II Bike lanes is good for encouragement, makes them more accessible to non-drivers, and helps reduce vehicular traffic to trailheads. CORBA is at present in full support of the plan. It will be presented to the County Rec and Parks Commission later in the year, and subsequently to the L.A. County Board of Supervisors for adoption. Update March 16, 2014: The plan will be presented to the Planning Commission on March 26, 2014. Meeting starts at 9 am at the Hall of Records Room 150, 320 W. Temple Street, Los Angeles, California 90012. The Parks and Recreation element is agenda item #6.i. The Trail Master Plan map and powerpoint presentation are available on the County’s web site. Update, March 26, 2014: The LA County Regional Planning Commission held their hearing on the draft plan today. Steve Messer, Jim Hasenauer, Ken Raleigh and Tony Arnold all testified in support of the plan. One private landowner, and five equestrian representatives also testified in support of the plan, all of them mentioning multi-use trails. Nobody spoke against the plan. Other elements of the County General Plan were also presented to the Commission, who held the matter over until their next meeting in April. We are confident the Planning Commission will approve the plan, which will then go before the Board Of Supervisors later in the year. This entry was posted on Wednesday, March 12th, 2014 at 10:15 pm and is filed under Advocacy, Environment, Los Angeles, Santa Susana Mountains, Trail Access. You can follow any responses to this entry through the RSS 2.0 feed. You can leave a response, or trackback from your own site.